Several months ago, I sat in a warm conference room in the University of Houston Bauer business school. The wind gusted outside; professors and a couple of brave students shuffled papers on a conference table between presentations. I was privileged to be an advisory board member and mentor at this Enactus UH event. Unexpectedly (to me), an adjacent student leaned over and asked about marketing career paths. What an intelligent question! I realized determining a marketing career path can be utterly confusing as a student. There are slick advertising agencies, PR boutiques, massive corporations with large silos and vague job titles all around. What on earth is an account executive and what makes it different from an account planner, account manager or anything else? In that moment, it was my pleasure to share with this student how to evaluate marketing career paths. Some years ago, I was strangely fortunate that by providence I’ve enjoyed such an easy, clear path so far in my young career. Reflecting on that exchange, there are likely thousands of students seeking clarity and guidance on marketing careers. 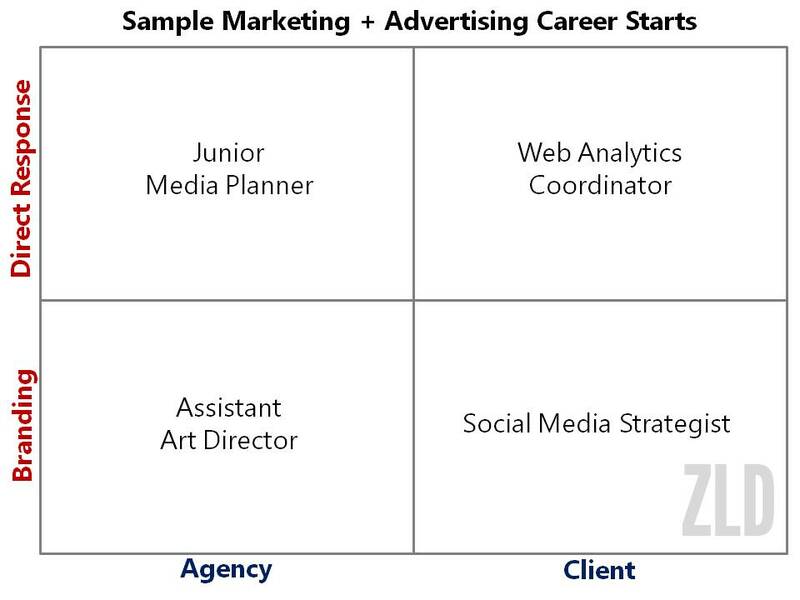 Below is a simple method that shows you marketing careers at a glance, with detailed explanations below. In marketing, you make major two choices that determine your career path: where you work and what you do. You’ll either work at an agency or a client and you’ll either focus on branding or direct response. Obviously, there’s room for a lot of creativity and nuance – but a large portion of marketing careers fit this framework. We’ll start here, because I’m most familiar with this area. An agency is a 3rd party that a brands such as Adidas or GM hires to help with marketing. Agencies exist because they provide expertise and impartiality that brands can’t get in-house. Marketing and advertising agencies are a great starting point to master tactical execution. You’ll often be on the sharp end of the spear: pulling reports, writing copy and auditing campaigns. It’s often a fast-paced environment. The offices have bright lights, open concept floor plans, and quirky perks. Working in an agency is fun! However, it’s imperative you do some homework before joining an agency. I’ve been very fortunate to work at agencies that offer great benefits and pay. My agency experiences have been nothing short of phenomenal. Regrettably, not all marketing agencies are that way. Some agencies can be volatile if clients leave or have long/tough hours in uncertain conditions. That said, it’s your privilege of choice! If you’re not the agency, you’re likely the client. If you’re on the “client side”, you’re likely working in-house at a brand like Hilton or Neiman Marcus. Client side marketing can vary a lot, depending on the marketing maturity of your organization. In some organizations, you may be managing agencies, vendors and strategy. In less-developed or smaller companies, marketing may be closer to sales support. In general, client-side jobs are more stable and evenly paced than agencies. Deadlines are usually more relaxed and the pay is generally higher compared to agencies. However, marketing can be vulnerable in a corporate setting. If your organization falls on hard financial times, accounting and marketing are the first functions to be cut. Much like agencies, there are great brands and tough situations. Do your homework! Now you know where you can work in marketing and advertising. The aspiring marketer’s next major decision is what you do. In marketing, you either focus on consumer actions or consumer perceptions. The art and science of branding focuses on consumer perceptions. Branding is a fascinating discipline. You constantly fight battles in the minds of brands and consumers. You must appear first, as the best. Branding jobs often have “creative” or “strategist” somewhere in the title; a keen sense of strategy is key to your success. To learn more about branding, you should read the classic, “Positioning” by Al Ries and Jack Trout. A caveat to branding-centric positions: you may lack experience in tactical marketing execution at the expense of creative pursuits. If you’re a strategy maven (which is rare), you can survive without concrete tactical knowledge. If you’re weak in strategy, it can be tough to advance your career in this field. The other major marketing avenue is direct response. Instead of focusing on consumer perceptions (branding), you work with consumer actions. Direct response is self-evident, you work to produce an action from a consumer. If you envision a purchase funnel, direct response typically handles the end: making a sale, strengthening a relationship. Direct response jobs often have “analyst”, “planner” or “specialist” in the title. Working in direct response is fantastic to build practical, tactical experience that can be used in many places & many ways. You’ll find skills such as auditing, research and optimization highly marketable. The upside of starting in direct response is that marketing is inherently self-promotional: the barriers to entry are low. However, if you don’t chase strategy skills, you can be quickly stuck as a tactician and encounter long-term difficulty advancing your career. The good news: marketing career paths are an open playing field! The bad news: marketing career paths are an open playing field. Hopefully this post brings some definition to a broad field, while pointing out benefits and risks.